Elephants are highly dependant on water, not only for drinking but also for their skin and general hygiene. During their evolution, they were probably fully amhibious, and the present asian elephants are reported to have swimmed over three km in the ocean. Wild elephants still today enjoy a daily bath if its possible, and they should be showered daily in captivity. Apart from the hygienic point of view, elephants need a daily shower for their skincare, and its not only physically important, its also important for their mental well being, especially for bulls in captivity. Take your time, and let the elephants also enjoy the shower, not only being cleaned as fast as possible. Places that should be cleaned, but for some reasons sometimes may be neglected, is behind the ears, inside of the hindlegs, the pockets where the tusks and tushes becomes visible, the wrinkles in front of, or under the eye, the temporal gland, the nails and the area above the nails, the stomach and under the base of the tail. Too often the back is not regulairly cleaned and the supra skin removed, why the animals have layers of dead skin over their back. Animal welfare people may sometimes argue that the elephants should do their skin care themselves. If they have a nice pool, they might actually soak there for hours, but this is rare, in most cases they can only relax if there is a keeper nearby, seing to they are not attacked by other elephants if they lay down. if there is no pool, but only shower its even more an illusion that they take care of their skin themself. The fact in captiviy is, that even if they get the possible technical arrangements, they will mostly just wet their head for some seconds or minutes, if there is some "natural" waterfall or likewise. So, taking full resonsibilty for those animals in captivity, includes a good skin care. In colder climat: before letting the elephants out in the encosure after shower one must to make sure they are completely dry. A good routine to check this is to put and hand between the foreleg and the stomach, this is the last place likely to become dry. Letting elephants out in bad wether will cause joint problem and disturbance of blood flow in the ear venes. Reaumatic problem might appear many years afterwards, when its to late do anything, why it simply must be prevented earlier. Dan shower Mala at Circus Krone, Germany. 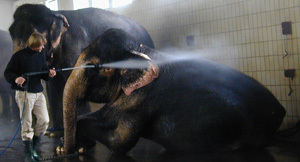 High pressure shower can be used with elephants, but only after a soft training period when they get used to the noise and the vibrations. Due to the frequency of rumbling, they probably hear something different than we do. If they are introduced to the machine in a calm, sensible way however, they will accept being showered this way, and some individuals actually show signs of enjoying the feeling of the "zone-therapy", especially if you use warm water. When cleaning the elephants, it is vital to keep enough distance between the pipe outlet and the skin. Normally there is safe to keep a distance about the lenght of one hand away from the elephant. This type of shower can improve the skin and nail condition very positive, and if its introduced in a calm way, and not forced upon the elephants with stress, they will also get used to this type of washing, and not only benefit from it, some will also really like it. Important is of course also that the elephants have a possibility to bath, swim and play in water. It is essential to learn how to operate the pressure shower before you try it on the elephants. Experiment with different distance to objects and learn how the sound changes. This will help you later to keep a safe distance, hearing when you are to close to the elephants. Avoid the area around the eyes, the openings to the ear, and the temporal gland. And remember its an elephant and not a lorry! If you are trying with a borrowed machine, remember that it might have been used with strong chemicals, so let large amounts of water through it before you use it on the elephants!! Power washing can contribute to the spread of infectious diseases.